Took part in Art on a Postcard and their PV last night. A secret auction raising money for Hepatitis C. Head down to 8 Devonshire Square EC2 to look at the exhibition. Or Art on a Postcard for a online view. Stretching across the entrance hall of a 45 story residential building in Elephant & Castle for the Uncle Group. Its the tallest residential building in London and the artwork at 14.5 meters is the longest print we've produced. Printed onto a aluminum frame by Cascade Group. Work showing with Fflow Gallery / NY AAF 2018. 21 - 25 March - The Pavillion, Ny 10011 Booth 1.39. Royal Academy is doing their second tour of PricewaterhouseCooper's art collection. Housing five of my paintings this set displayed at their Riverside building next to Tower Bridge. The building designed by Foster + Partners. Guided Tour 6.30 - 8.30pm / 04th December 2017. 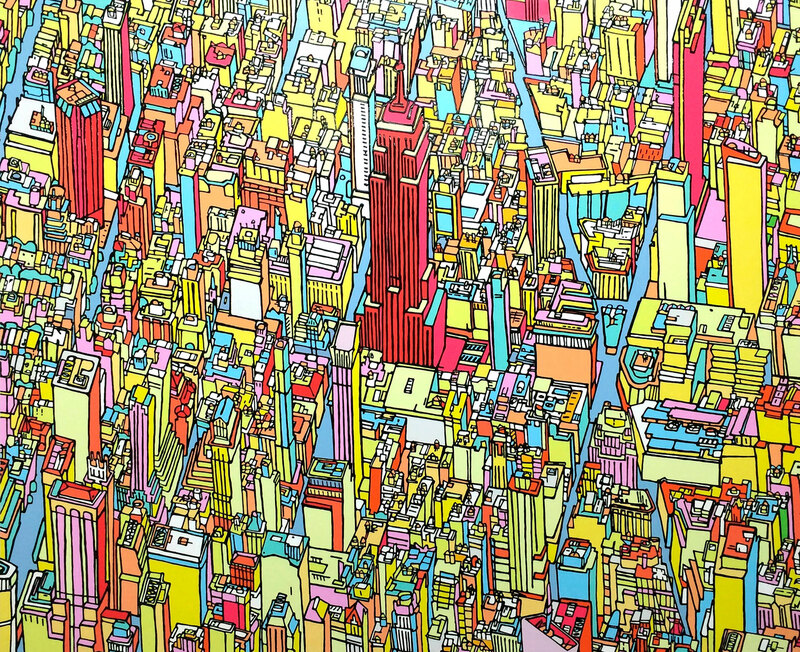 Tommy will be displaying three of his pencil cityscapes at MONOCHOME with three other artists. Exhibiting from 27th Oct to 16th Nov. Private View Wednesday 1st November. Charlotte Street, London W1T 4PU. Go to The Woolff Gallery site for more info. Royal Academy is doing a tour of the PricewaterhouseCooper's art collection on the 14th September 2017. Thanks for the stunning cover shot. Work done in 2013. 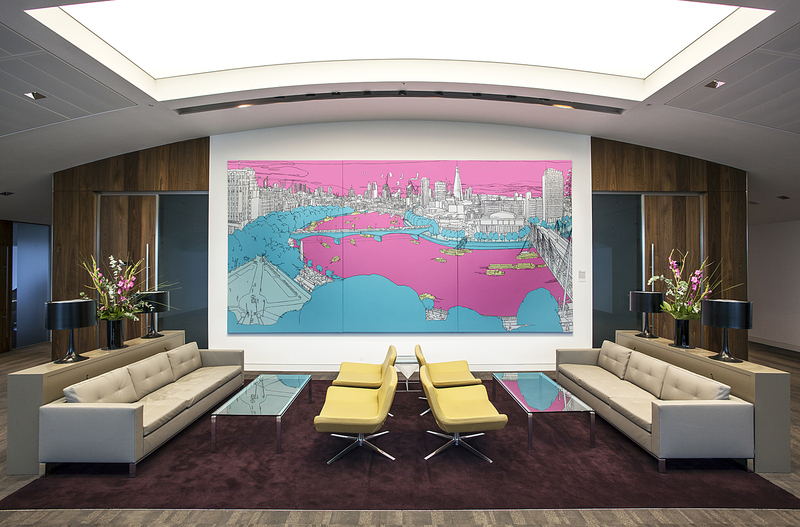 2 x 6 meter triptych entitled Embankment that resides on the ninth floor of 1 Embankment Place, London. Exhibiting at the Apart Gallery for their summer show - "Objects of Desire". Work hanging from May till July, Notting Hill 113 -137 Westbourne Grove, London. Exhibiting at AAF Hampstead this weekend, work hanging with the FFlow gallery, London / June 16th to 13th. A group Summer show at The Woolff Gallery. Exhibiting artists include: Russell West, Joanne Tinker, Valeria Nascimento, Jack Tanner, Uri Dushi, Susila Bailey-Bond, Clay Sinclair, Pam Glew, Carol Peace. Drawing - Holding Hands [ Cannon Street Station ]. Graphite on 170gsm Firenze Paper, 68cm X 81cm H.
Work showing at London West Bank Gallery - BigBang exhibition, group show at their new Gallery 3-5 Thorpe Close W10 5XL. Tonight // 14/01/2016. Art work will be showing till end of Febuary. 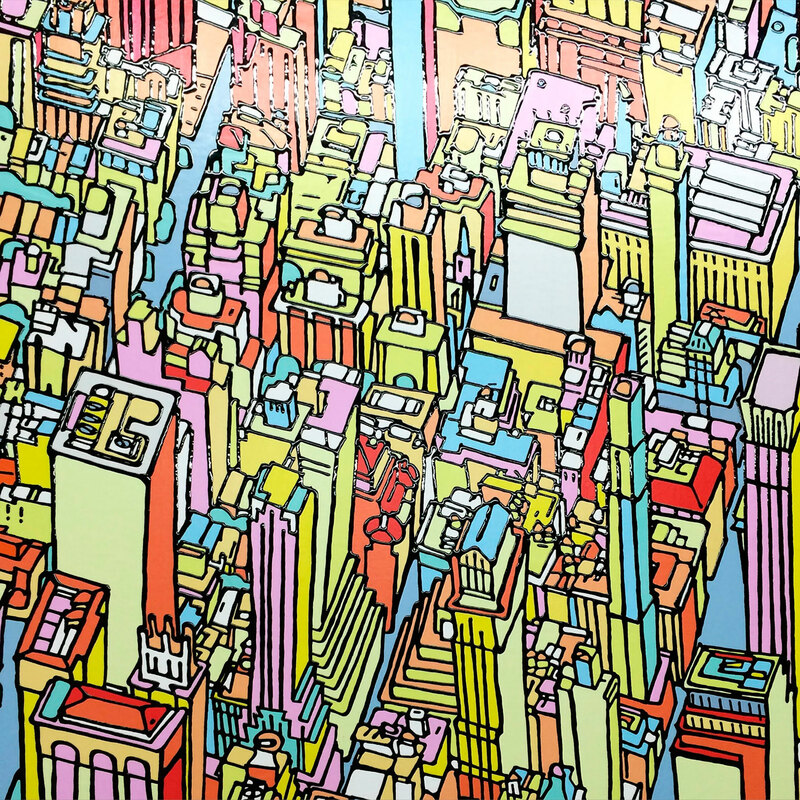 Tessellated map painting of Manhattan / Midtown. Lexington across to 7Th Ave and 31st to 38th, with The Empire State Building at the centre. Titled Manhattan Grid. Enamel & acrylic / Print on Board 125 x 105 cm high. Grid maps of the New York and London city from above. Take a closer look at 'prints'. Recently had lots of interest in this Embrace Album Cover - Drawn from Memory. Fans asking about the original art work and prints. Their were fifty signed editions done at the album cover size. Thanks to everyone who entered the giveaway for the two prints. Winner was one Sue Kleinman. Got in! IdN Pick of the Month (POTM), thank you to Priscilla. 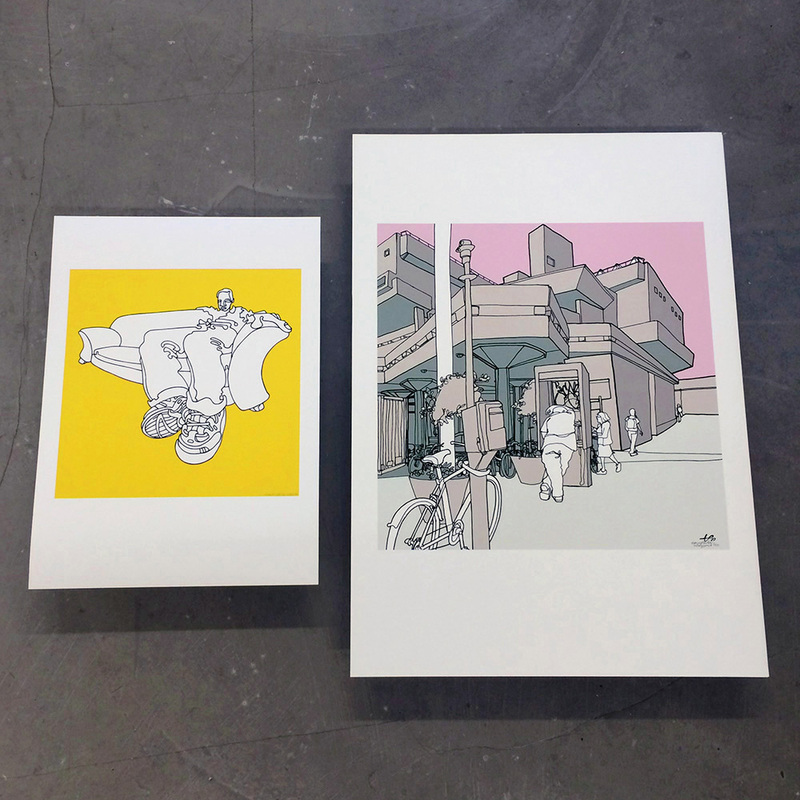 I’m giving away two free giclée prints to celebrate the redesign of this site. 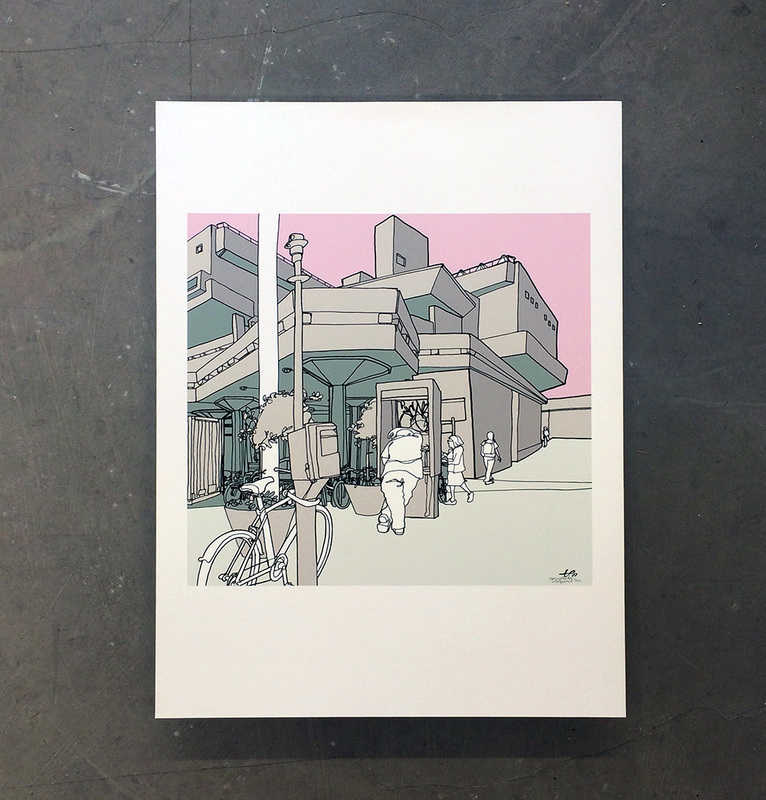 Everything But The Girl (A2) and Hayward Gallery (A1) on 300gsm 100% cotton mould-made paper. 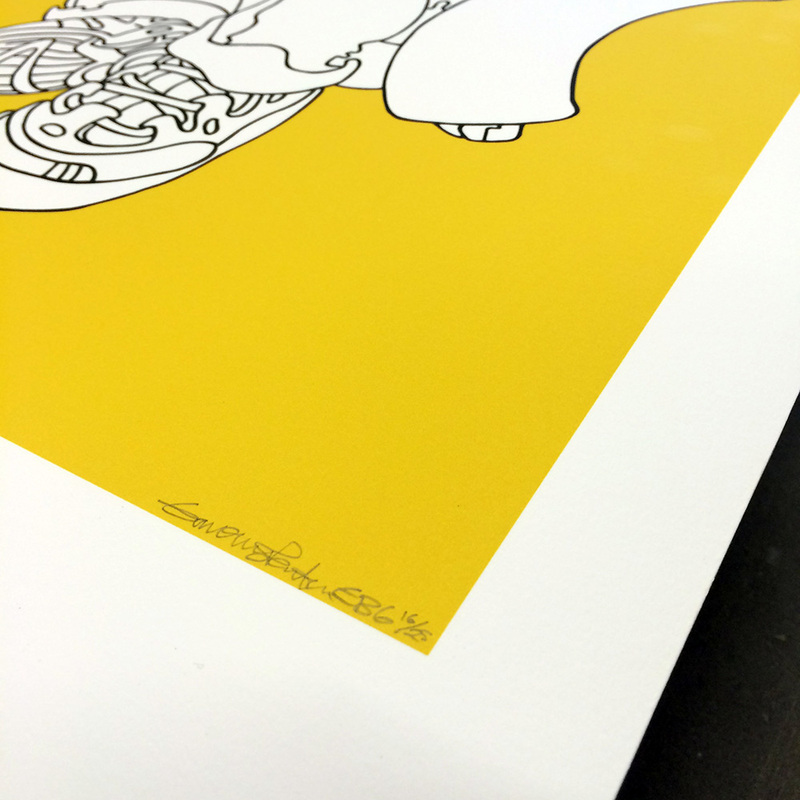 Signed & limited editions. 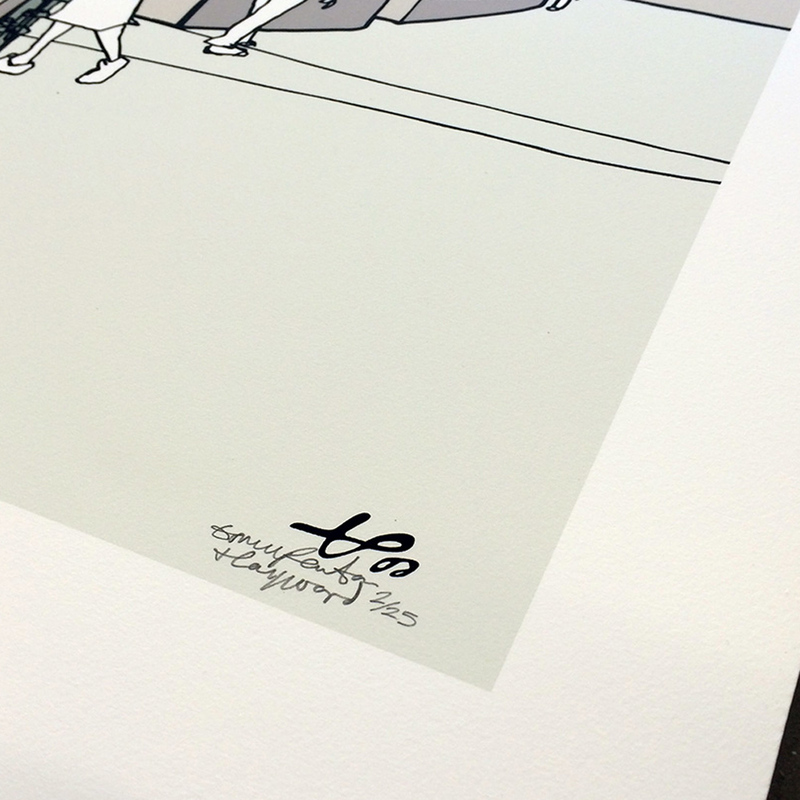 Email your details to info@tommypenton.com & I’ll drawn the winner at the end of October. Terms & Conditions below. Terms & Conditions — Giveaway open worldwide to all ages. Only one entrant per mailing address per giveaway. Giveaway includes both prints as a single prize. No purchase necessary to enter or win. A purchase does not improve your chance of winning. Void where prohibited by law. Winner will be selected at random & will be notified via email on the 31st October (GMT) & must respond to the winning notification within 48 hours or another winner will be chosen at random thereafter. This giveaway is in no way associated, sponsored, endorsed or administered by either Facebook, Instagram, Pinterest, Tumblr & Twitter or any other entity unless otherwise specified. All entrants are automatically included in the artist’s email subscription list. 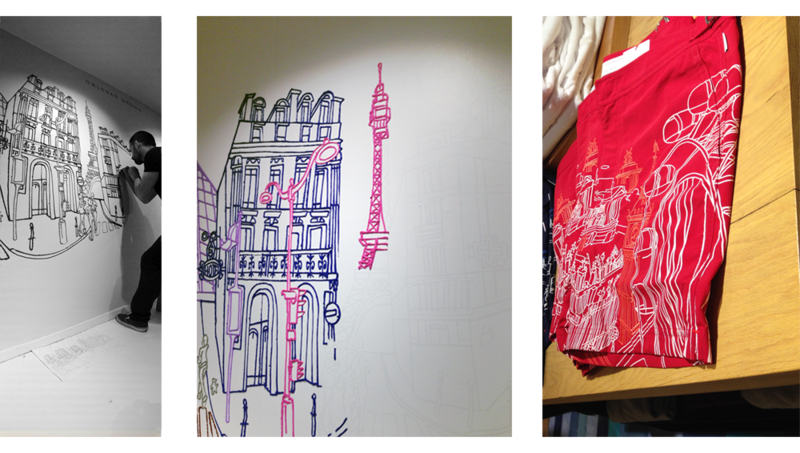 Another live art piece was set up in Paris at Le Bon Marché where they have an exclusive on the collection. I was positioned at the main entrance of the building & painted continuously throughout the day working my way across the ‘Paris’ work pushing thick acrylic paint through plastic syringes. Good food, hot weather & great company — travel tips are stay in Montmartre, ride bikes, eat at Chez Toinette & Guilo Guilo [awesome website]. Two framed drawings, I completed recently, now hang in Staffan Tollgård’s showroom in Chelsea & open to the public. 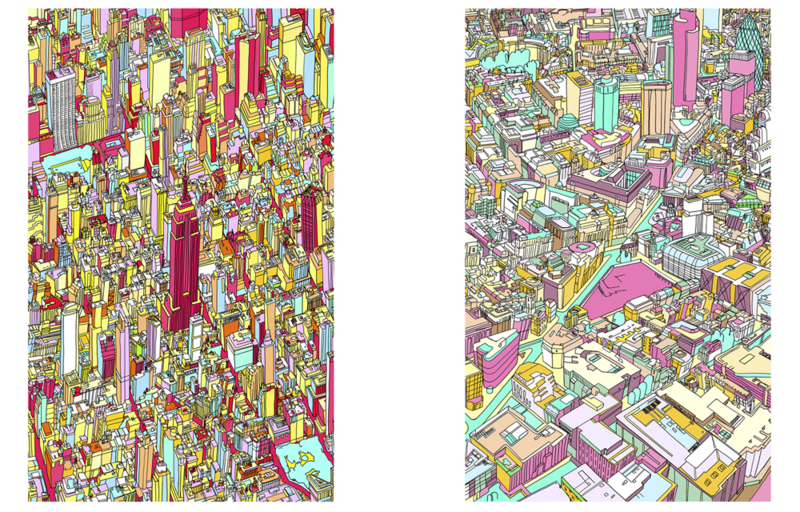 NY and London are both 118x84cm & created with charcoal over giclée print. Designed four pairs of shorts with Orlebar Brown, released in the UK in August. 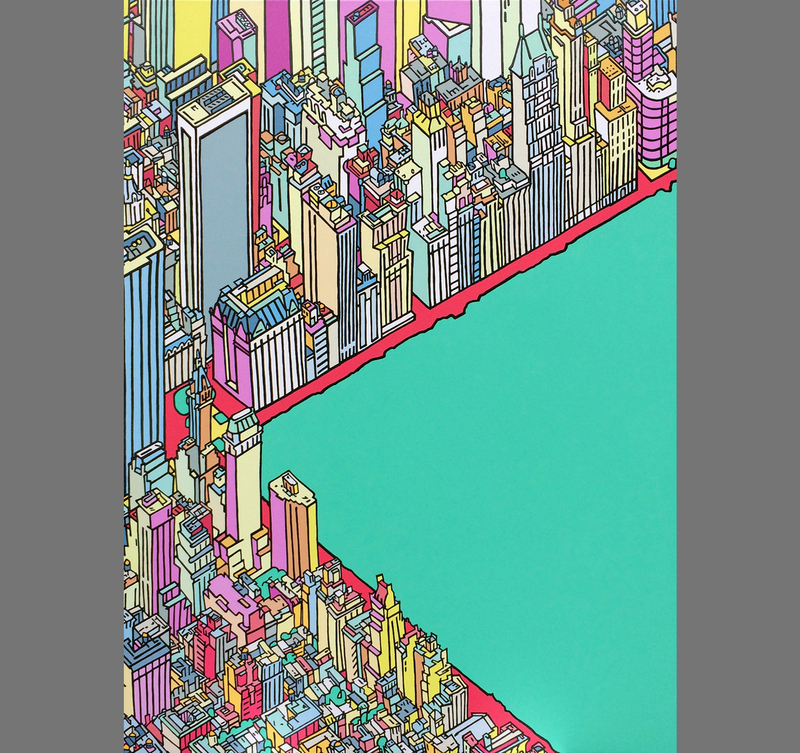 The different skylines include New York City, London [shown below in illustration form over Bulldog pattern] Paris & Rome [which didn’t get produced!]. Good people — thanks to Adam at the top & designers Wayne & Caleb who took me through the stages. Paper maquettes were produced to help see, cut & shape before samples came back from Portugal. First shown at London Collection: Men 2014. Produced a live artwork as part of the show. It’s worth pointing out that the blue ‘London’ shorts (centre) have now been updated to red. All the shorts are now available in store & online. Images below from Vogue Menswear. 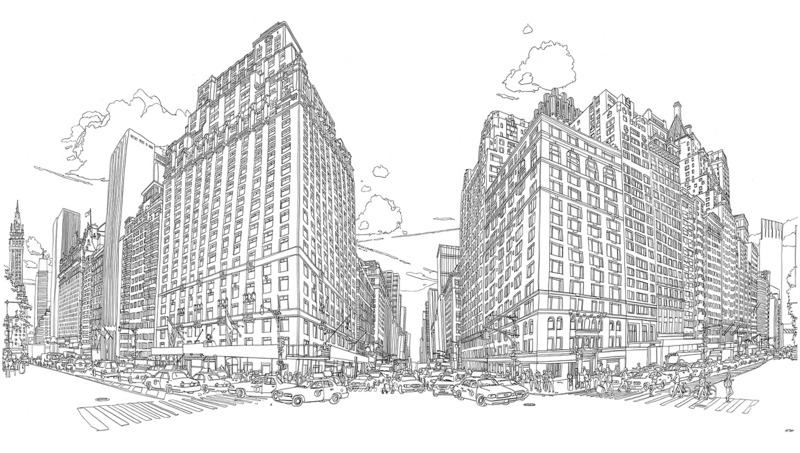 Six months in New York researching work for a graphic novel. Pushing for publication in 2015. Below is West 59th Street & 6th Avenue by Central Park. 我最喜欢的一张是我的第四张 (Back To Mine)，音乐人是 Richard X，也是从这张开始，封套画面更加迷幻复杂，色彩也更丰富，西装革履的 Mr.插头脑袋玩着膝盖上的键盘合成器，身边长着巨大人手的鸭子，兔子，奶牛，杜宾犬等好奇的朝向他，粉色背景下暧 昧又诡异，Richard X 的选曲和混音充斥着7，80 年代太空感和颓废劲. (推荐曲目 Discomanic) Article taken from China‘s Vice magazine website. More on Mr. 插头脑袋 here. Canvases waiting for collection. 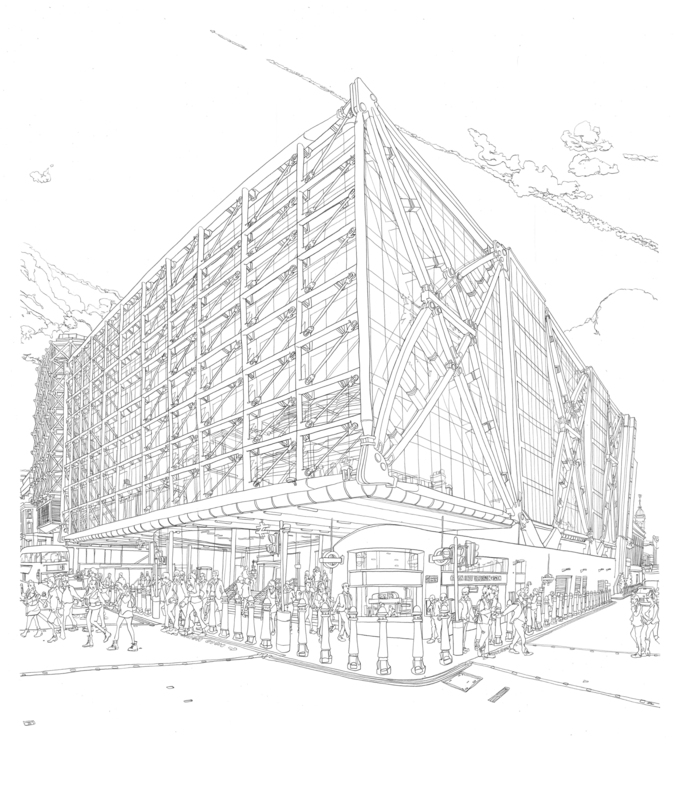 Their final resting place will be 1 Embankment Place, PwC’s newly refurbished buildings. Photos in situ taken by Angelo. At 2-6 metres we sliced it into a triptych yet it was still too large for the stairwell. Finally it had to be winched up to the 9th floor. Praise given to the weather man! 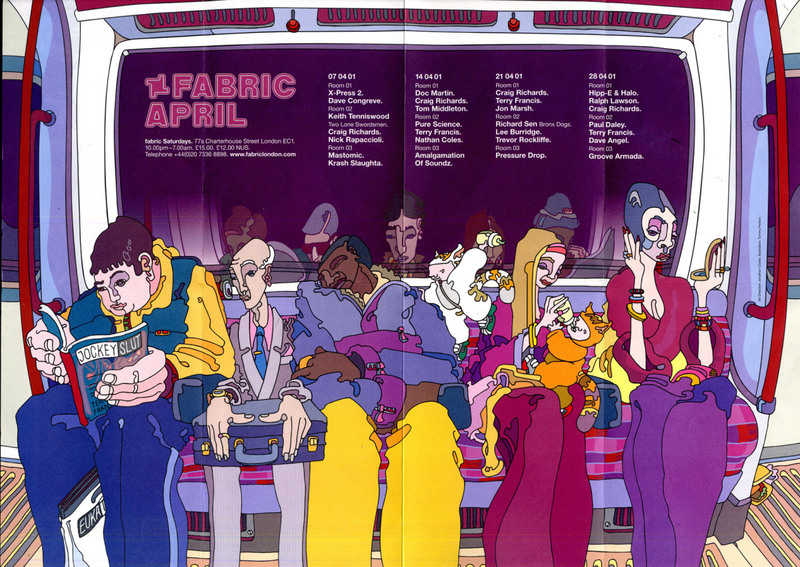 Kind words from Joe Bloggs about the Fabric flyers I illustrated ten years ago. Originally there were meant to be twelve illustrations [a full year] with one released each month. The work completes a ‘day in the life’ of a man & his feline friend walking around the city. The job fell by the wayside & only six were drawn. Once in a lifetime experience with BFK & Crossrail. Invited on an underground journey from Royal Oak portal to the edge of Farringdon. We attached a video camera to the front of the cart for a hypnotic trip below London’s Underground to the sound of grinding metal. A line of neon stick-lights took us to depths of 40m to find ‘Ada’, a 1,000 tonne tunnel boring machine (TBM), 140 metres in length & with an external diameter of 7.1m. The cart, reached the front internal structure of the TBM, delivers the massive concrete segments, grout, tools & miners respectively. 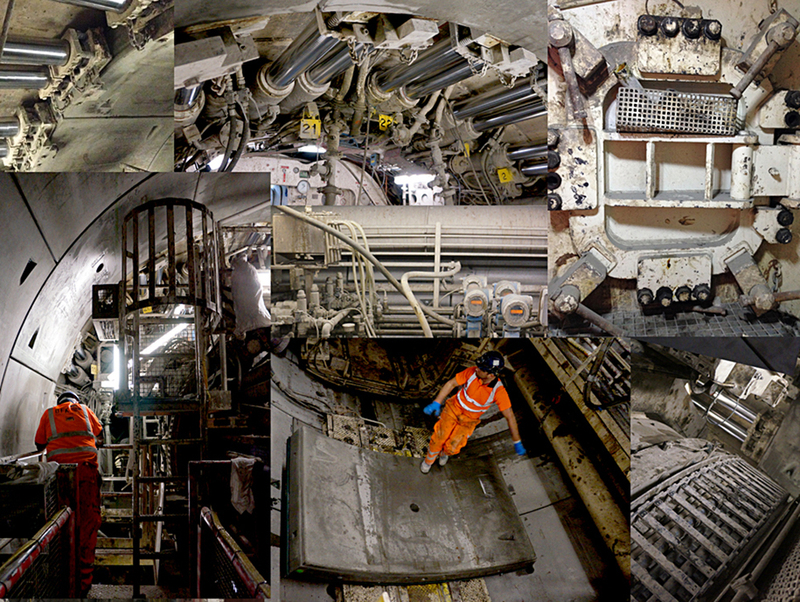 The machine grinds through over 3,000 tonnes of London clay & rock each day which is being sustainably reused & delivered via train to a bird-sanctuary island on the edge of London. 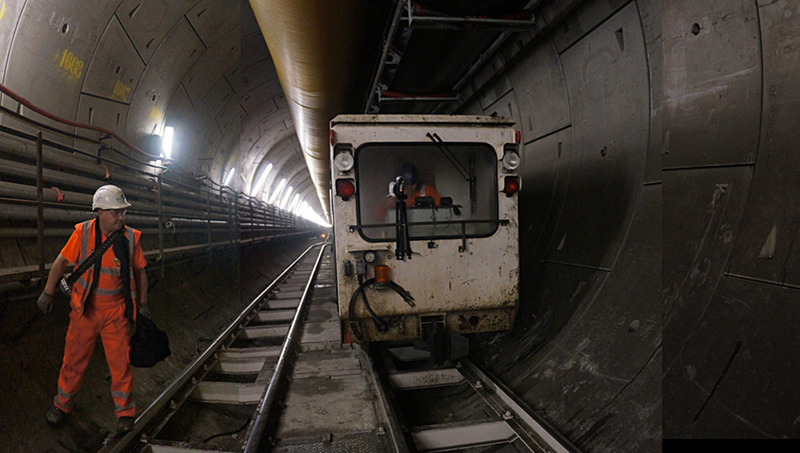 Ada is one of eight TBMs tunnelling under the breadth of the city. Artwork to follow. Completion date for Crossrail estimated 2018. Massive thanks to all those at BAM Ferrovial Kier including Ivor Thomas, Karen Gibbons & miners Willie [in picture], Pat, Hillary & all the other miners l met along the way. Also thanks to Claire for sharing some of her photographs. After winning a Dickson Russell commision for PwC’s newly built offices I produced these. The building is designed by Lord Norman Foster & rests on the edge of the Thames at More London. 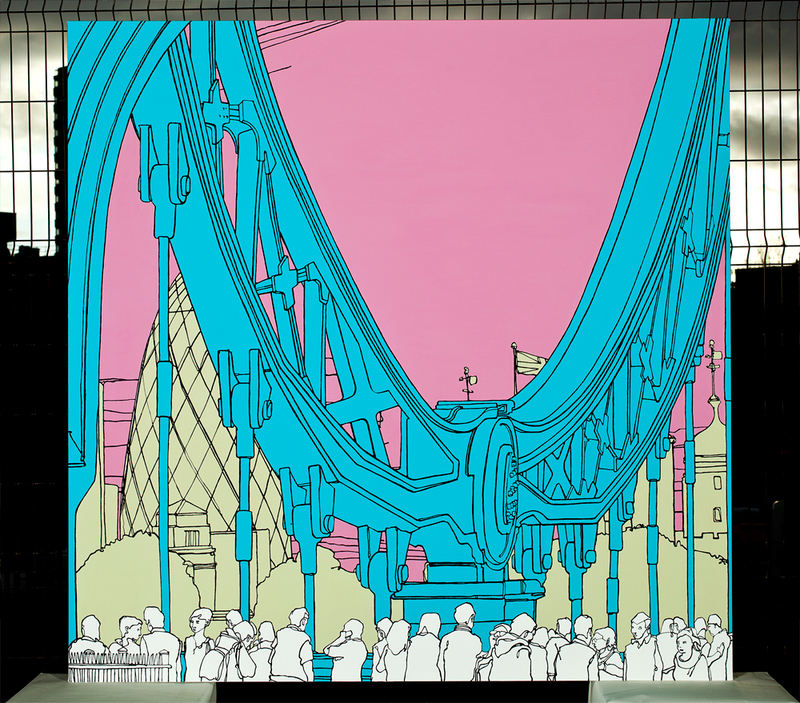 Canvas based work includes Southwark, Westminster, Southbank & Tower Bridge. 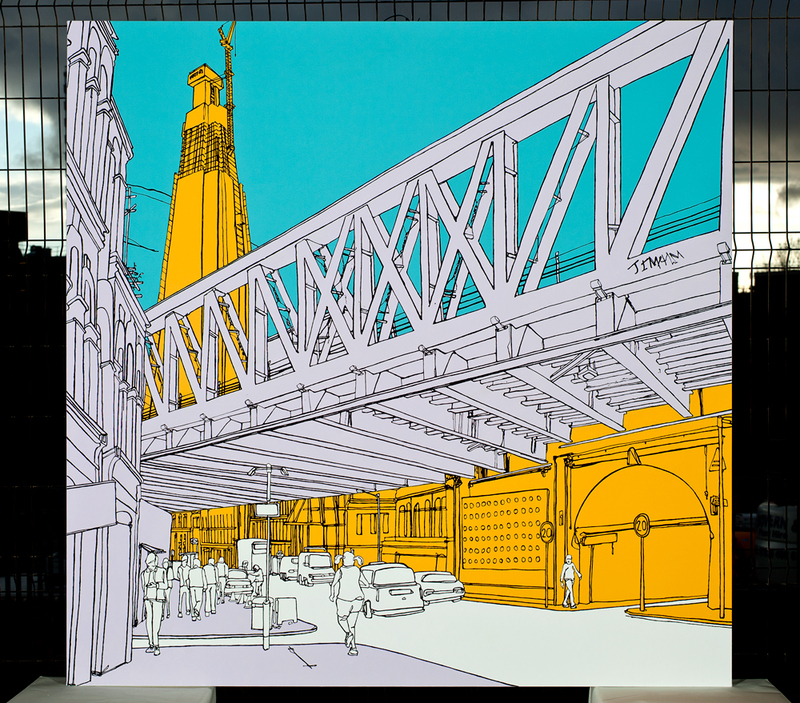 Painted in acylic & enamel at 185x185cm. Photos by Angelo Plantamura [images 1 & 2] & Noel Mclaughlin [work in situ]. The Apart Gallery is having a new show for the next three months till late August. I’ll be show large canvas paintings & framed soft lead work on paper. 55-57 Great Marlborough St, London. New limited edition box designs for Big Tree Jewellery. A blackberry bush, willow tree & wild rose are home to four of the hand cut silver charms. Available at Magma. Sorry no longer available at Magma. Big Tree Jewellery gets picked up by Magma shop for the Xmas rush. Magma Product Shop, 16 Earlham Street, Covent Garden, London, WC2H 9LN T +44 (0)20 7240 7571. Contemporary art for under £3,000. Will have work hanging at the Battersea Art Fair, London, October 20th to 24th, 2013. Big Tree Jewellery is a collaboration with jeweller Melissa Hunt. It comprises of a range of nine individually hand pierced silver charms presented in a bucolic countryside scene designed by myself. Melissa handcuts the silhouette of each character in silver. This collaboration results in a beautifully designed card that contains high quality silver jewellery. The 0.7mm thick polished sterling silver discs are 3cm in diameter & suspended from 3.5cm of 1mm box chain with a connecting T-bar clasp. The fastener enables the pieces to be worn as a necklace, bracelet, dog tag or button hole. These ready-made bespoke gifts are packaged with an envelope & clear sleeve. Big Tree Jewellery can be seen at Origin London Craft Fair 23-29 September 2010 at Old Spitalfields Market. Also at the Barbican Library 02-23 December 2010 [Private View to be announced soon]. Please email for any enquires. 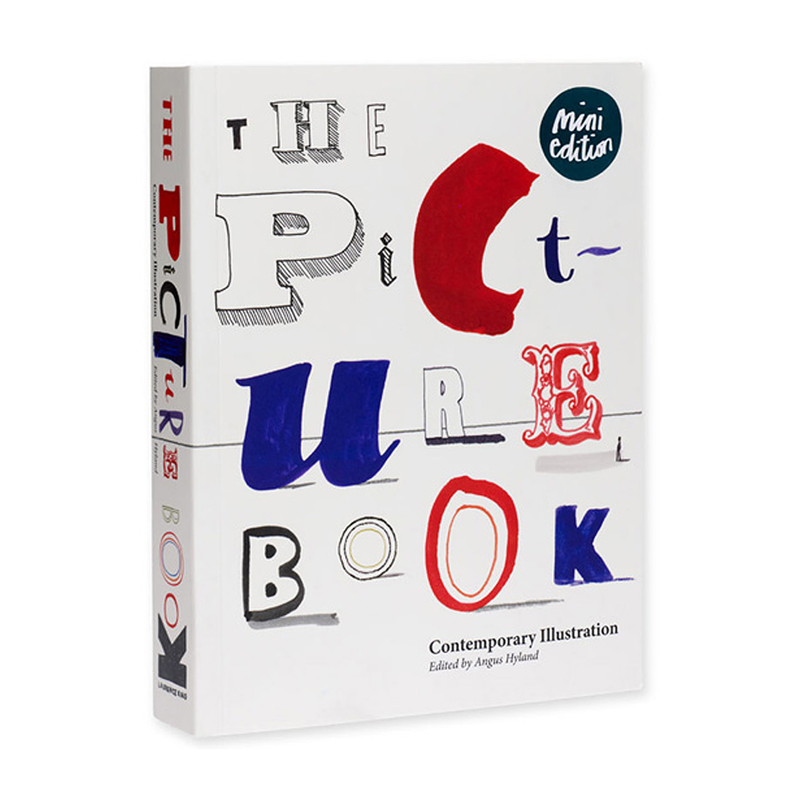 The Picture Book: Contemporary Illustration has been reissued into a mini edition by Laurence King as a result of the popularity of the full scale first edition. 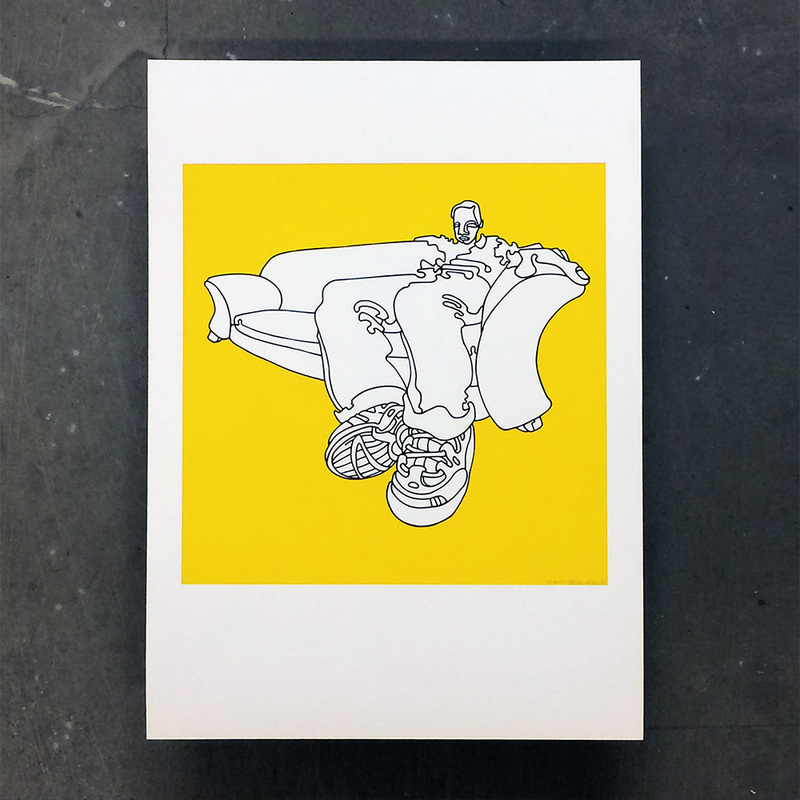 Edited by Angus Hyland at Pentagram, it showcases contemporary illustration & was first printed back in 2006. Among some of the featured artist are Yuko Shimizu, Kate Gibb, Ian Wright, Travis Chatham, Tom Gauld, Zissou, Jo Ratcliffe & Tommy Penton. Work on show at the Apart group show. Sean Alexander & Ben Allen also showing. 133-137 Westbourne Grove, London. Launch Party 19th May, show runs till July 11th. As you can imagine I’m more than happy to have work selected for Creative Review’s new Illustration Annual, as part of the July issue. You should buy one. l’ll probably buy about five! Will have my door open at Open Studios. Dec 12th-13th, 12-6pm. Great Western Studios, London W2. Will be hanging new work from New York. The Tate to Tate cover has been short listed for the V&A 2009 Book & Book Cover Illustration Awards. Created animation for The Flicker Club. Made into a 50 page flicker book to celebrate the opening night screening of The Birds by Alfred Hitchcock. 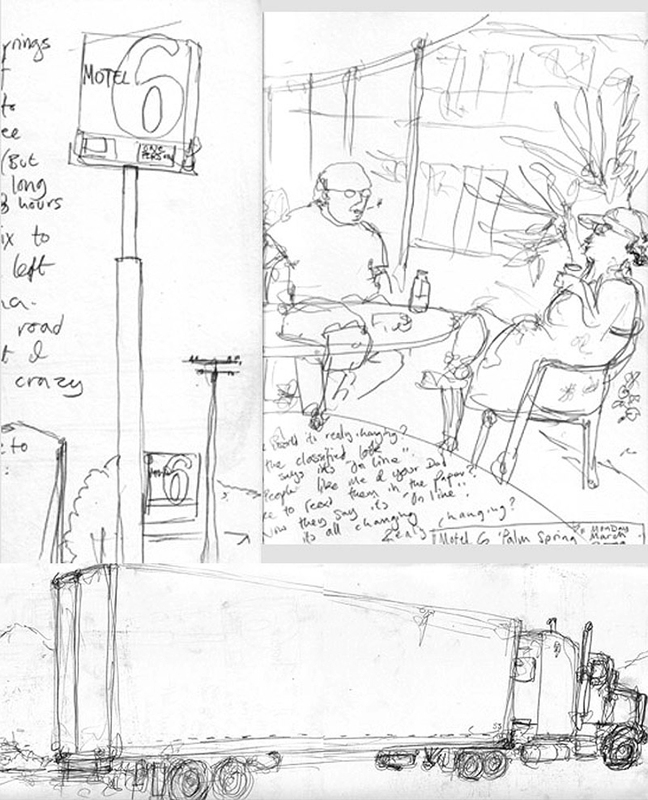 Here are sketches from a 4300 mile road trip starting in San Fran and ending up in New York. Taking the Southern route on Highway 10! Asked to do a new book by Cape, but stuck for ideas the perfect solution L.A. —‘freaks, ugly meets plastic’, Texas — ‘All road & sky’, New Orleans — ‘Tragic’, D.C. — ‘History’. Joined Kate Gibb for the fourth year to contribute artwork to the Cancer Research ‘Sound & Vision’ event at Abbey Road Studios which includes a silent auction of music memorabilia. Paul Weller played new music. I donated a New Order album cover print & raised £1400. Tate to Tate Exhibition at the Menier Gallery, Southbank, London. 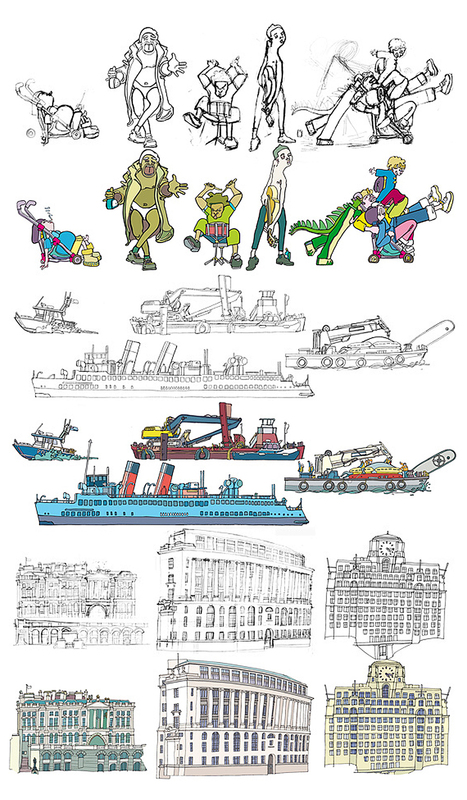 A 30ft giclée print showing the walk along London’s Southbank streaches the entire length of the gallery. All to help with the lanch of the Tate to Tate limited edition hand-bound book. The first ten books were individually leather-bound by David Penton and all sold out on the night! With Claire’s help we received some nice reviews including a beautiful post in Creative Review thanks to Mr Gavin Lucas. Apart Gallery & Nokia joined together 60 artists to reinterpret the same sculture. 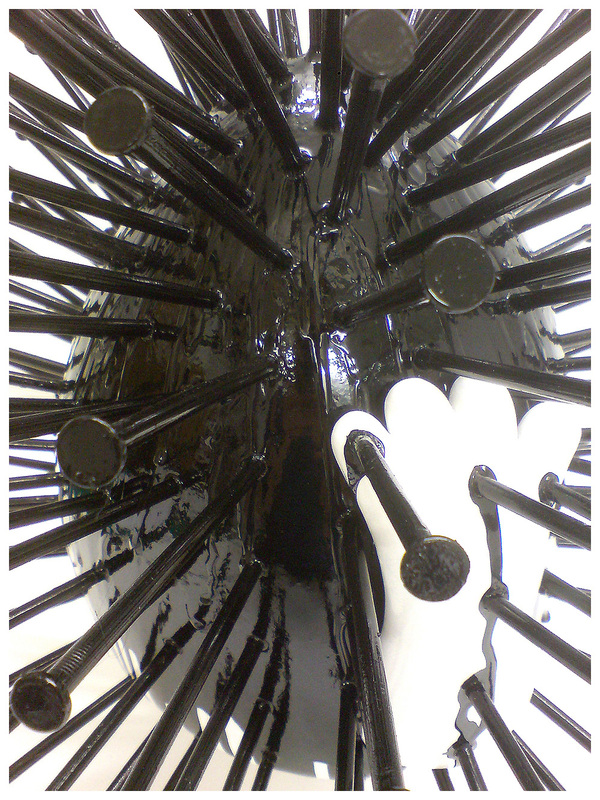 Mine is a vinyl figure dripped in black gloss with 120 nails. Started in 2005. The book Tate to Tate by Jonathan Cape is out. Amazed! No problems — publisher was golden, they kept the same size, layout, colour, just a change of cover & added ‘The Walker’s Companion’ by good friend Brian Parker. 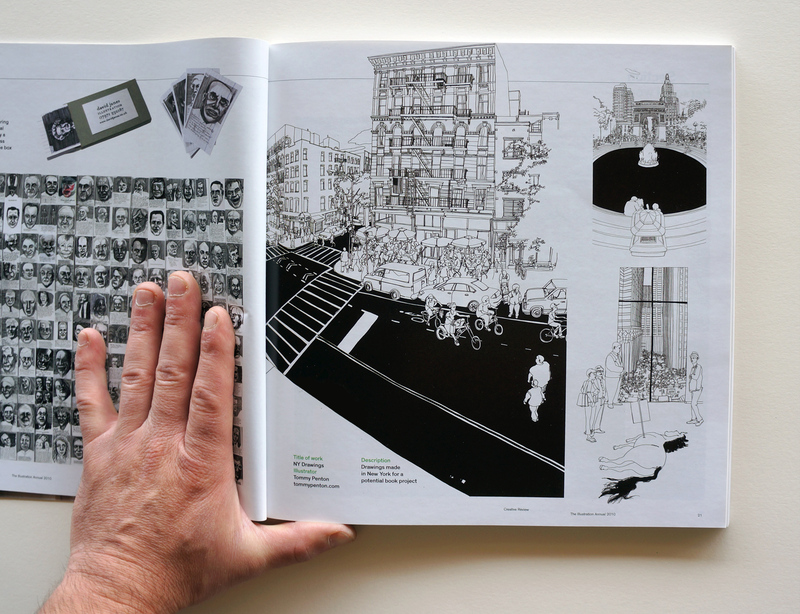 The book is one long illustration over 68 pages. A visual walk along the South Bank from Vauxhall Bridge to the Millennium Bridge. Taking nearly two years to accomplish — elements were drawn separately before colour & design gradually implemented on the mac. 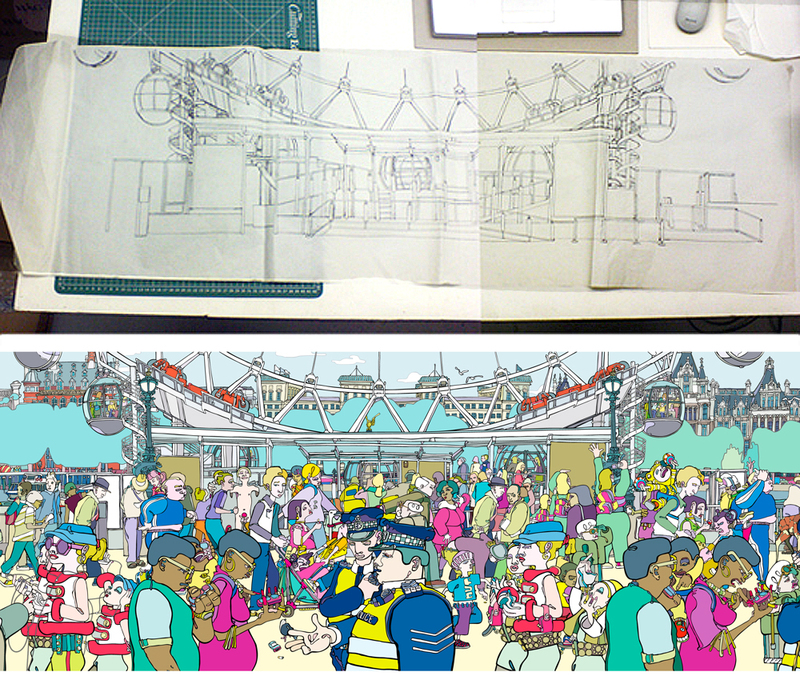 Shown here are some rough layouts next to finished work. 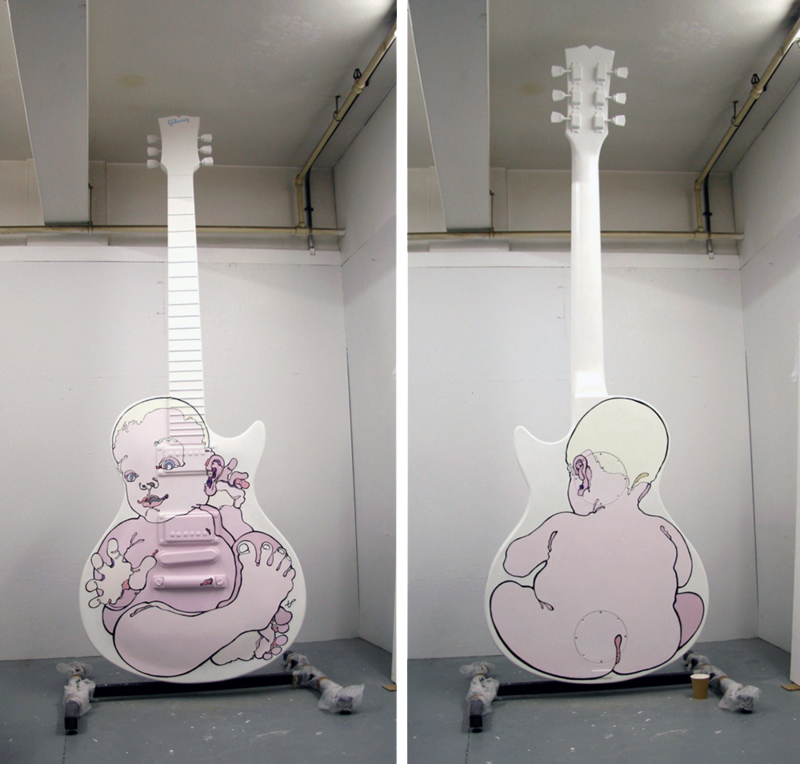 Here is the 10ft high Gibson sculpture, before collection to head down to the Thames. Used fiberglass paints & it was like mixing glue, strong fumes & had half cut Spanish onions spread around studio to help absorb the stench!